A lovely if slightly bizarre experience on Saturday, when I showed two Brazilian mega-bloggers around Savile Row. We went through the bespoke process at Gieves & Hawkes, visited the workshops, and popped into both Gaziano & Girling and Anderson & Sheppard. Although Brazil is as brand-hungry as you’d expect a newly emerging wealth centre to be, there are some encouraging signs – not least Kadu’s (above) interest in hand-sewn canvases. You can follow the discussion on Blog do Kadu on Savile Row by entering your email address in the box below. You will then receive an email every time a new comment is added. These will also contain a link to a page where you can stop the alerts, and remove all of your related data from the site. He may be better looking , he may have more hair and his shoulders may be much more masculine, but does he own bespoke adelaides though?? Gotta love Kadu’s enthusiasm! 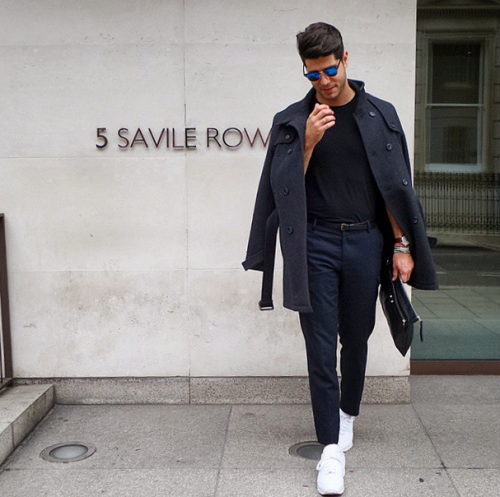 Just as I did years ago, my first stop to London featured a long stroll down Savile Row. I’m sure he’s a nice guy but his Instagram photos do paint a picture of someone a tad self absorbed, with a clear lifestyle focus. I much prefer your focus on craft. Also, in addition to the Adelaide’s you have a killer Liverano in purple. I don’t think the boy in the white trainers has one of those either. I’m definitely looking forward to the linen suit details. I saw a photo of a blue one on the Cacciopolli website a few weeks ago and it made me go …hmmmmm.